If you can pay that price, though, you’re getting some of the fastest SSDs that anyone will sell you in any computer. Apple has been ahead of the curve on SSDs since it began moving away from SATA drives to PCI Express drives in 2013, long before anyone else thought to do it. The company has continued to extend its lead by adding more and more PCIe bandwidth and aggressively adopting standards like NVMe. I still own a mid 2011 27” iMac. When I bought it in july 2011 I thought that the machine would feel fast for a while. But in february 2013 I got a Lacie SSD Thunderbolt drive (the HDD was the bottleneck of the machine and it felt slow from time to time) and it became the boot drive for the iMac (remember that the mid 2011 iMac was the first iMac with Thunderbolt ports). Using the external Lacie SSD was a huge improvement in performance and boot time. A had no beach balls anymore and the apps loaded very fast. It was like I would get a new Mac. 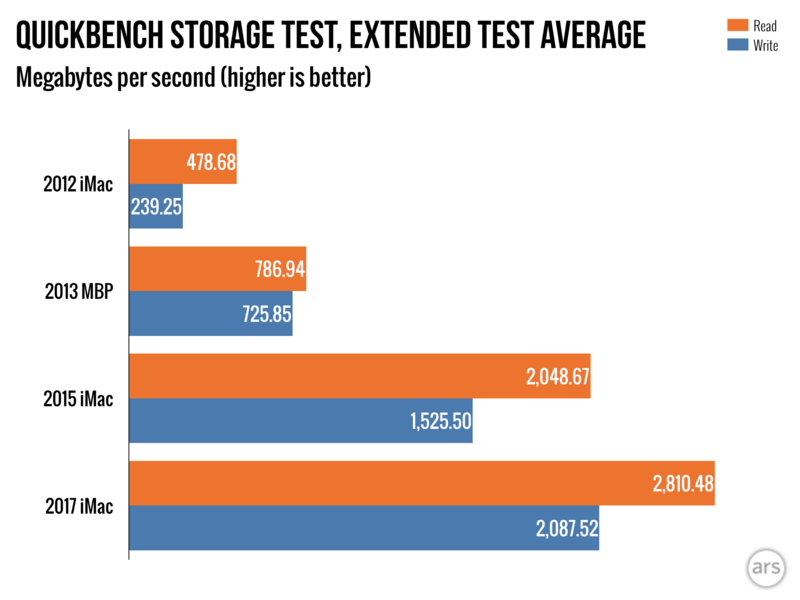 Now just look at the Quickbench storage test. The 2017 iMac has a read speed of 2800 MB/s. That’s a huge number. My point is that Apple made a big step in making Macs with fast drives. But something bothers me: why do we need a Fusion Drive in 2017? I get it that a 1 TB or 2 TB SSD is expensive but Apple could put a 256 GB SSD with an 1 TB HDD into the iMac making the SSD as the boot drive, whereas the HDD would be a storage drive. I hope that with the next generation of iMacs Apple will get rid of Fusion Drive.